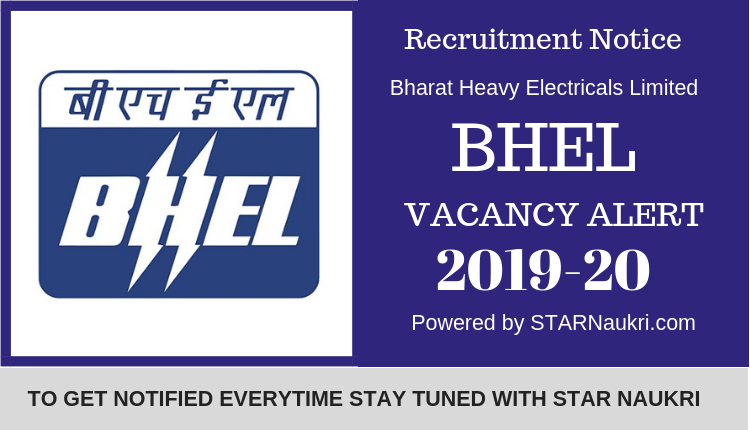 Bharat Heavy Electricals Limited (BHEL) recruitment notice on their official website. There are 80 vacancies for the posts of Engineer (FTA- Civil) and Supervisor (FTA- Civil). The details eligibility and application process are given & mentioned below. भारत हेवी इलेक्ट्रिकल्स लिमिटेड (भेल) भर्ती नोटिस त्यांच्या अधिकृत वेबसाइटवर. भारत सरकार द्वारा स्थापित आणि स्थापित भेल हे नवी दिल्ली येथे स्थित अभियांत्रिकी आणि उत्पादन कंपनी आहे. अभियंता (एफटीए-सिविल) आणि पर्यवेक्षक (एफटीए-सिविल) यांच्या पदांसाठी 80 जागा आहेत. पदासाठी कागदपत्रे सादर करण्याची शेवटची तारीख 18 फेब्रुवारी 2019 आहे. ज्यांना या पोस्टमध्ये रस आहे आणि पात्रता निकषांनुसार त्यांनी त्यांचे फॉर्म सादर करावेत. तपशील पात्रता आणि अर्जाची प्रक्रिया खाली दिली आहे आणि खाली नमूद केली आहे. 01. Engineer (FTA- Civil) (i) Full-Time Bachelor’s Degree in Engineering/Technology in Civil Engg. OR 5 Year Integrated Master’s degree OR Dual Degree Programme in Engineering or Technology in Civil Engineering from recognised Indian University/Institute with minimum 60% marks in aggregate for General / OBC and 50% marks in aggregate for SC/ST candidates. 02. Supervisor (FTA- Civil) (i) Full-Time Diploma in Civil Engineering from a recognised Indian University / Institute with minimum 60% marks in aggregate for General / OBC and 50% marks in aggregate for SC/ST candidates. पत्ता: अतिरिक्त महाव्यवस्थापक (एचआर) भेल, पॉवर सेक्टर दक्षिणी क्षेत्र, 6 9 0, ईव्हीआर पेरियार बिल्डिंग, अण्णा सालाई, चेन्नई -600035. Bharat Heavy Electricals Limited (BHEL) recruitment notice on their official website(careers.bhel.in). BHEL owned and founded by the Government of India, is an engineering and manufacturing company based in New Delhi, India. There are 80 vacancies for the posts of Engineer (FTA- Civil) and Supervisor (FTA- Civil). The last date for submitting documentation for the post is 18 February 2019. Those who are interested in these posts and according to the eligibility criteria they should submit their forms. The details eligibility and application process are given & mentioned below. Address: Addl.General Manager (HR) BHEL, Power Sector Southern Region, 690, EVR Periyar Building, Anna Salai, Chennai-600035. Team – STAR Naukri wishing you all the best. For further information like Call letter/Hall ticket, Timetable, Syllabus stay tuned with us.